Little Learners is a class designed for children still at pre-school. 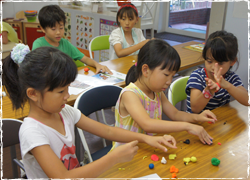 Our youngest age group class (without mums) concentrates on learning English through play, dancing and craft. The children will also enjoy a fun circle time and learn to study using workbooks. Early Learners class is for young children at a beginners level of English, to help them learn the basics of English and advance steadily over time, including days of the week, months, the weather, colors and numbers. The children learn reading and writing. How to hold a pencil, and practice their ABC’s. They use workbooks which help with their reading and writing, learning phonics and sight-words. This is a group class, and the children learn to speak and introduce themselves to the group. A group lesson for older beginners. For children who have an interest in learning English we teach basic vocabulary including days, months, numbers and practical sight words and flash cards. The children are also introduced to basic grammar rules, learn and practice phonics, and learn to ask each other questions in English. The children will also learn to read through suitable level reading books, and to practice spelling and hand-writing. The children receive workbooks which are completed each week. 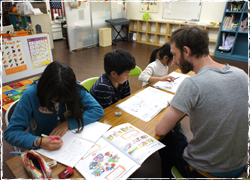 This class gives the children confidence to use basic English, and to apply it when English is taught in their Japanese schools. This class is a group lesson with the focus on learning to read. Using Oxford published reading books and workbooks, the students work through a series of materials which increase in level. The student will study phonics and sight words to help with their reading. Spelling and writing their own sentences, related to the Oxford books, help the students in their comprehension. English conversation is also an important part of the class, discussing the books the students have read. Group lesson for children with some English experience. 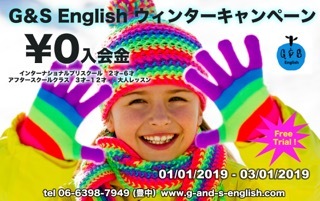 For children who want to continue and advance their English skills, this class teaches a comprehensive level of English grammar and provides the chance for children to practice their speaking and listening. The children already can read with some confidence and can make sound sentences in their writing, through appropriate workbooks and teacher-student dialogues, the children can advance these skills and prepare for ventures abroad. For children at an advanced level of English, can speak and read with confidence and can work productively either individually or in a group. Conversational English is encouraged in group discussions. Reading to high standard is an important part of the class, and the children are often asked to produce book reports on books they have read. As well as completing their workbooks the children also participate in extra curricular activities such as group craft making and organising events i.e summer festivals, giving the children a chance to put their English into practice. This class in particular is recommended for those aiming to take English proficiency tests. A 90 minute class focusing on learning English grammar. This demanding class requires students to have an advanced level of English and will be expected to communicate only in English. Students will be challenged to produce a high standard of work and will be given homework for class tests.